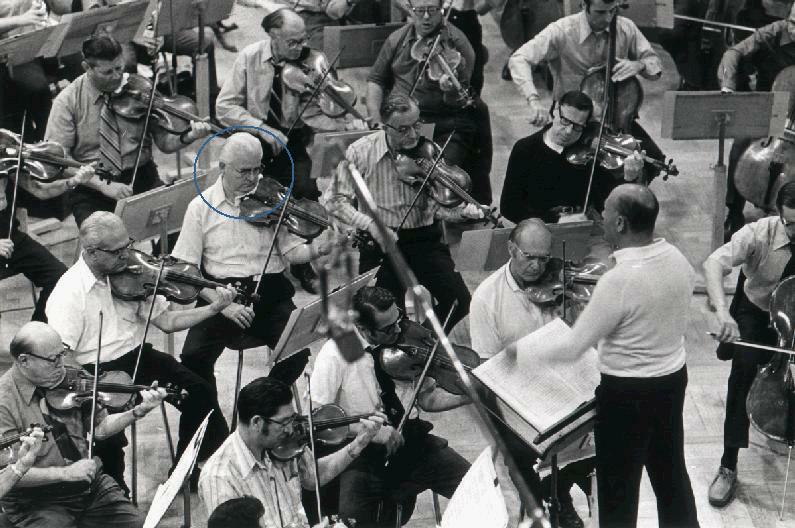 This 1971 photograph was taken of the Chicago Symphony with Georg Solti conducting while the orchestra was on tour in Europe. Here they are in Vienna, busy recording the massive Mahler Eighth Symphony, nicknamed ``Symphony of a Thousand'' for the immense resources it utilizes. Solti recorded most or all of the Mahler Symphonies with CSO during his illustrious tenure with the orchestra, most of them considered definitive. The recording being made in this photograph in particular won a slew of awards and accolades. I have it in my own collection, along with their recording of the second, third, fifth, and seventh Mahler Symphonies. Of these I know that Dad recorded the seventh. I don't know about any of the others. Dad didn't audition for the job his second stay. There was an opening in the section, and after auditioning the usual hundreds of candidates, there was still no player that Solti and the rest of management was satisfied with. Therefore Radivaj Lah, the orchestra's personnel manager, called Dad, who was around age 63 at the time, and asked him if he would like to play the season as a freelance player. He didn't have to ask twice. Dad continued to play with the orchestra through the 1973 Ravinia summer festival, even though my parents meanwile sold their house in Wilmette and moved to St. Petersburg, Florida. Today a job with the Chicago Symphony Orchestra is as good as it gets for orchestral musicians. The pay is the best, and so is the music. Most musicians fortunate enough to get a CSO job stay there until they retire or die. At this writing (May 2001), first trumpet player Adolph ``Bud'' Herseth, long heralded as the greatest orchestral trumpeter ever, is in his fiftieth (and final) year with the orchestra.